Members of Congress are trying to have it both ways on spending control. They say that they want to cut spending, but they also often refuse to take the tough votes to actually do so. Comparing the roll call votes for the Budget Control Act of 2011 and the Ryan-Murray budget deal reveals a bipartisan willingness to renege on past spending agreements. This signals that neither chamber and neither party is serious about fixing Washington's finances. Over 200 members of Congress broke their promise by casting two yes votes—first to cap spending, then later to break these caps. The BCA capped overall discretionary spending in fiscal years 2014 and 2015 to $967 billion and $995 billion, respectively; the recent budget deal calls for annual spending levels of over $1 trillion for the next two years. The votes show that unwillingness to keep spending promises is bicameral and bipartisan.Shortly before adjourning for the holidays, the House approved the Ryan-Murray budget deal with a vote of 332-94. Among those who voted yes, 184 had also voted yes on the BCA two years ago. These representatives included 62 Democrats and 122 Republicans. The Senate soon followed suit, passing the Ryan-Murray deal with a vote of 64-36. Forty-three senators who voted yes had also voted for the BCA. This group of lawmakers included 37 Democrats and 6 Republicans—Senators Collins, Hoeven, Isakson, McCain, Murkowski, and Portman. These conflicting votes are particularly problematic for Republicans, the party that claims to support limited government. Many Republicans were elected in 2010 with a mandate to bring the federal government back on a path of fiscal responsibility and prosperity. They are doing the opposite. Their votes reflect their willingness to support a big government, high-spending agenda instead of standing up for taxpayers. Defenders of Congress shrug and say that politicians routinely break their promises. They say we shouldn't be surprised by these conflicting votes. This may be true, but it overlooks the importance of the promise that these individual lawmakers made to control spending when they approved the BCA. As I discussed before on townhall.com, living up to this agreement has consequences for the balance of power and responsible budgeting. Congress' hypocrisy on spending control does not bode well for the future. 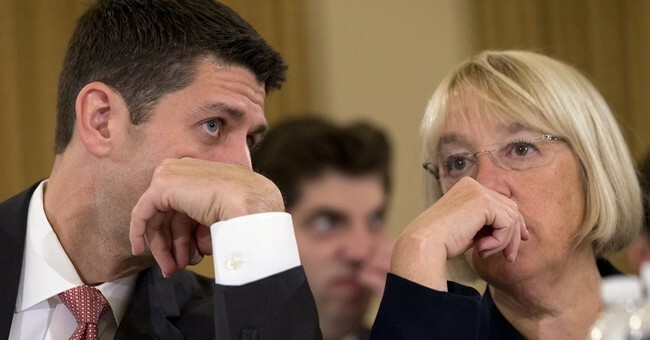 The Ryan-Murray deal shifts planned spending cuts into the future, when they will probably never be realized. Nearly 60 percent of the changes to direct spending won't happen until 2022 and 2023, the last two years of the budget window. Given that lawmakers are not willing to honor the promises they made just two years ago, it's very doubtful that they will live up to these future ones. Congress cannot have it both ways. Now is the time to stop saying one thing and doing another. Punting on fix Washington's spending problem will only make it harder to do so in the future. It will weaken the economy and undermine Congress’ credibility even further.